After two years of tragedy and uncertainty it was looking like a more normal year on the Nepal side of Everest. Then came some dramatic news. 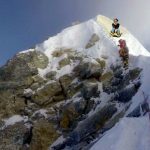 There were rumours that the iconic Hillary Step, the most feared obstacle on summit day, had collapsed in last year’s earthquake, and has now become little more than an easy snow slope. Can it be true? In this week’s post I examine the evidence. In 1953 it took the New Zealander Edmund Hillary some time to find a solution to the near-vertical 12m rock step on the South-East Ridge, a short distance below Everest’s summit. He eventually climbed it by leaning back on a snow cornice as he edged his way up with his feet. It was a hazardous manoeuvre that could easily have ended tragically had the cornice broken off behind him. But he made it to the top, and his climbing partner Tenzing Norgay came up behind him. A few minutes later the pair became the first men in history to stand on top of the highest point in the world (and return to tell the tale – there is continued speculation whether George Mallory and Sandy Irvine did so in 1924, but they died on descent, so it is likely we will never know). The South-East Ridge from the South Summit. The Hillary Step is the black rock section on the ridge just below the final summit snow slope (Photo: Anselm Murphy). 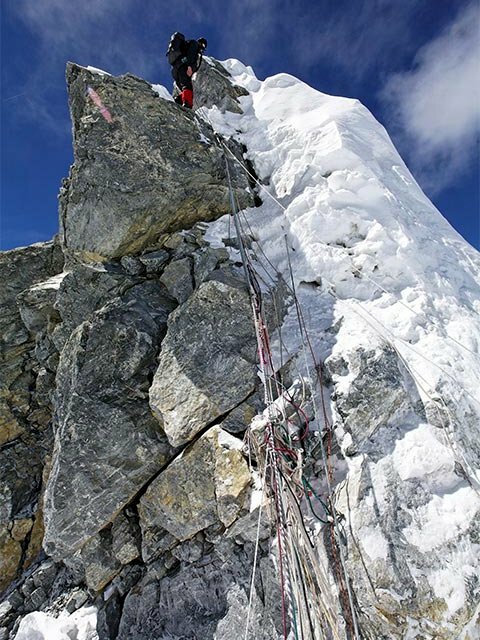 The Hillary Step, as it is now known (if, indeed, it is still there) is the last technical barrier on the normal ascent route up Everest’s South-East Ridge. It has become easier to climb since Hillary and Tenzing’s day. Commercial operators now fix ropes up it, which means it can be climbed by means of a jumar, a device that clamps to the rope, allowing climbers to haul themselves up. On busy summit days the Hillary Step becomes a bottleneck. 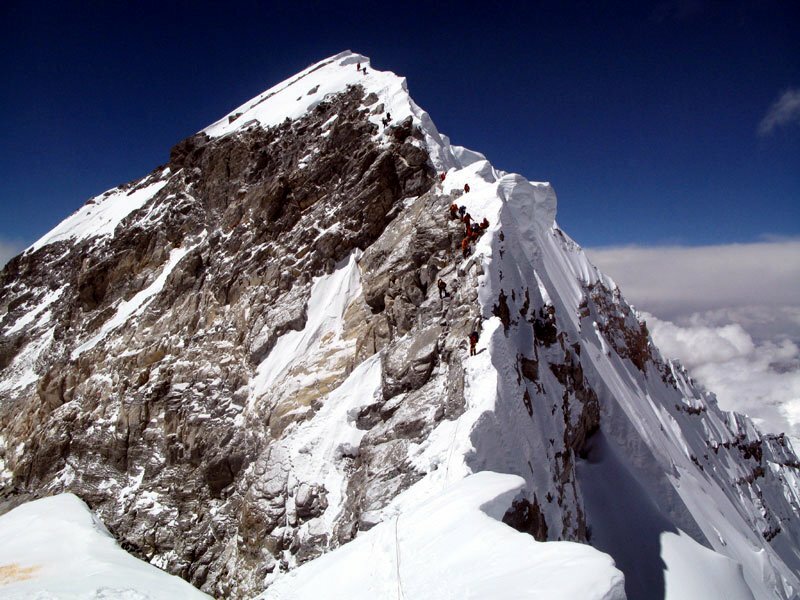 The media often reports exaggerated waiting times of up to four hours for aspiring summiteers queuing for their turn to climb it. I don’t know how reliable their sources are for these claims, but certainly waits of up to an hour would not be surprising. At that altitude, in extreme temperatures, such waits can be extremely dangerous, bringing on conditions such as frostbite, hypothermia, and high-altitude cerebral or pulmonary edema (also know as HACE and HAPE, extreme forms of altitude sickness which can very quickly become fatal). 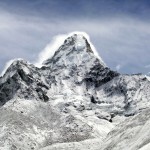 In the last two weeks there have been hundreds of ascents of Everest by the South-East Ridge. In some respect it’s been looking like a more normal year on the Nepalese side of the mountain after two tragic years. 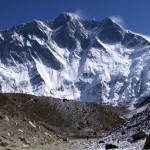 An avalanche and a strike in 2014, and a 7.8-magnitude earthquake in 2015 meant there were no summits from Nepal in either year apart from a strange one in 2014 involving controversial use of a helicopter. Then after his successful summit on 12th May, the Mexican climber David Liaño published sensational before and after photos of the Hillary Step on his Facebook page. It was his sixth ascent of Everest. He reported that the step was very different from his previous climbs and said that he believed it must have collapsed in last year’s earthquake. This post would be hard to explain without the photos, so I am reproducing them here under fair use. For clarity I have added some text to the photo to illustrate David’s point. The numbered rocks 1, 2 and 3 do indeed unmistakeably appear to have moved. The question mark is over rock number 4. Because the two photos appear to have been taken from slightly different places I can’t be certain. If 4 in the before photo is 4a in the after photo, then they have not moved much. If, on the other hand, 4 in the before photo is 4b in the after photo then there has been a significant shift. In this case it looks like rock no.3 was originally attached to 4a and has broken off, falling some distance. 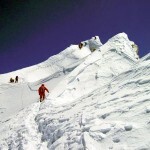 In around 30 – 40 minutes we were able to proceed along the snow covered ridge towards the true summit. In a ‘normal’ season this section is mostly a rock climb, but this year it was entirely on snow. 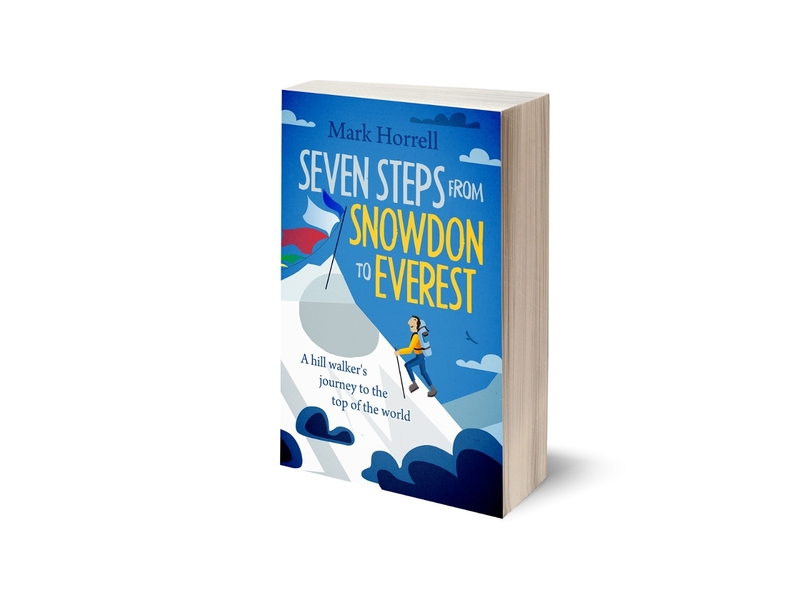 The ‘Hillary Step’ was unrecognisable, buried beneath deep snow. Hillary Step snow covered, only some snow steps. easy walk. 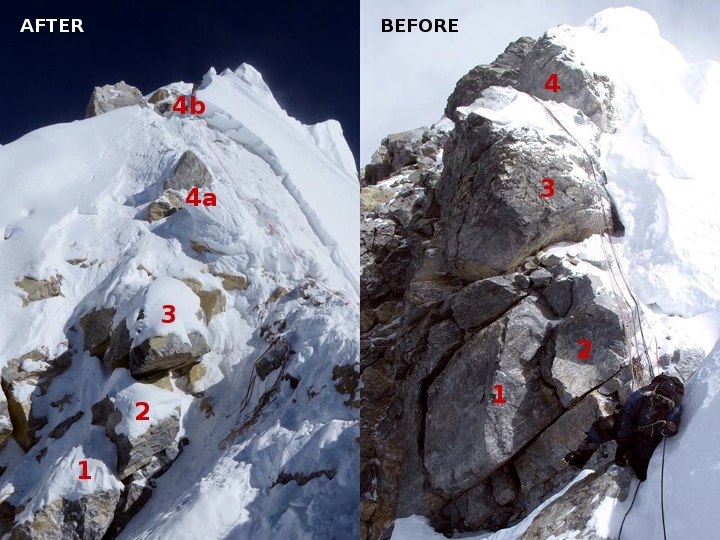 British climber Kenton Cool, who made his 12th ascent of Everest this year, also tweeted a photo of the step, but said he simply climbed it to the right, making no mention of a possible rock collapse. So who is right? Perhaps they all are. It’s not unknown for a natural phenomenon to suddenly change the topography of a mountain. Two days after Belmore Browne and Herschel Parker’s attempt on Denali, the highest mountain in North America, in 1912, a huge earthquake shook the mountain. When Hudson Stuck and Harry Karstens came to climb it the following year it took them three weeks to climb the Karstens Ridge, a feature which had been straightforward for Browne and Parker the previous year. The earthquake had caused the ridge to become a tumbling mass of crumbling ice blocks. In 1991 a huge rock avalanche at the summit of Mount Cook, the highest mountain in New Zealand, removed an estimated 12 million cubic metres of rock, taking the top off the mountain and leaving a knife-edge ridge which has since eroded further. When a team of scientists surveyed it in 2013, they concluded the mountain was around 30m lower than it was before the avalanche. On the other hand, it’s also possible for huge quantities of snow to turn a rock climb into a snow slope. A few years ago I wrote an entire blog post about this phenomenon on Manaslu. When Toshio Imanishi and Gyalzen Norbu Sherpa made its first ascent in 1956, they had to climb a shattered rock tower to get to the summit. When I climbed it, it was an easy snow slope. Can this have happened on the Hillary Step? There have been reports of thigh-deep snow between the South Summit and the Hillary Step this year, but it would still be an extraordinary event. Everest historians are welcome to correct me, but in all the thousands of ascents of Everest from the south side since 1953, as far as I know nobody has ever reported it being an easy snow slope. 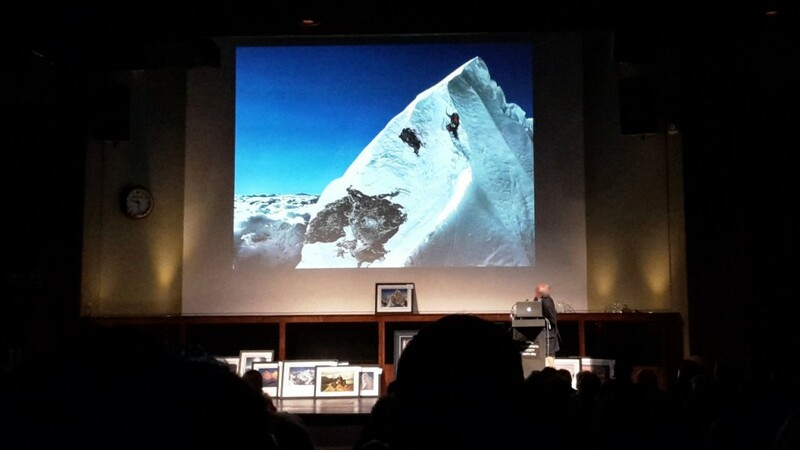 Even in Doug Scott’s famous photo of the Hillary Step after monsoon snow, Dougal Haston is clearly having to swing his axe above his head in order to climb. I don’t have an answer now, and I climbed Everest from the north side, so I never saw the Hillary Step myself. But personally I believe both of these factors – increased snowfall and earthquake damage – may have played a part in conditions this year. In any case, we will have an answer eventually. As climbers return from the summit and post their reports, we will hear more details of the route above the South Summit. They will only be speculation for now, but in future years the snow will clear from time to time and Chomolungma will reveal her secrets. And if it’s true, and the Hillary Step has gone, then perhaps the mountain gods have had a change of heart. With two years of terribly tragedy, the Sherpas believed the gods were angry. Perhaps they didn’t like what Everest had become – thousands treading its slopes with no heed for its sanctity. But with the Hillary Step gone, and no more traffic jams at its base, perhaps they are saying, “come back”. Anyway, on a lighter note, somebody seems to think the mountain is still closed. Here’s what happened when I typed “Hillary Step” into Google the other day. Interesting. Would like to believe that the H step is intact just covered in a lot of snow. Nevertheless, it should not be considered as an easy climb by mere hill walkers like me. Very interesting Mark. I think it is marvellous that you are keeping such a record of Everest. Particularly like your use of black type. Makes it easier for me to go back and get a resume. I’m thinking of making a collection of them. Mark, Great article as always. Do you know if the earthquake caused any ‘changes’ on the North side, like the Second Step? Good question, but sorry, I don’t. I’ve heard quite a few people wonder if the “Second step” on the North side could have altered after 1924 perhaps due to quake or rockfall etc. That said, just where and when would anythign have occurred?. In 1933, there were some strong opinions by Smythe et. al on the step’s difficulty, so could the step morphology have changed between 1924 and 1933?. What about after the 1930’s?, so by 1960 when the Chinese arrived, it was different compared to decades earlier?. Also, just what part of the “second step” would have altered?. The rock on the headwall is rather rotten, but to the left of the “off width crack”, its sheer and discrete. To the right of the headwall its also rather rotten, but some wonder about its potential via some cracks which may yield. However to my knowledge, no-one has ever attempted to the right of the headwall. Thus I’m at a loss as to where any section could cleave off the “second step” due to quakes. Odd too that no accumulated shards of rock of any noticeable size have been embedded in the mid section snow patch justy below the headwall of the step. Something that may well result during any putative rockfall above. Thus I’m a tad sceptical of the idea for the “second step”, but the Hilary step imagery is most intriguing and may well have changed recently. Note that on the Kenton Cool photo the numbered blocks of your “after” photo are visible and that these blocks appear to be of a much smaller in scale then than on your “before” photo. Yes, Paul. This was actually reported by Tim Mosedale and others last week, though it took the BBC and other mainstream media outlets a few days to latch onto it. You’ll notice from the date at the top of this post that I wrote it last year. As I correctly stated in the article, more of the Hillary Step’s secrets would be revealed in future years when conditions change and more mountaineers climb past it. This is what has happened in the last week, as hundreds of climbers having been passing it on their way to the summit, many of whom climbed it in its previous state, including Tim. This year there appears to be less snow than there was last year, allowing greater scrutiny of the position of the rocks. It’s also entirely probable that the rocks have moved again in the last year as snow piles up, freezes and melts again, and hurricane force winds continue to batter them. It would not surprise me if there is more movement before they eventually settle into a more permanent position. Look very closely at your pictures with rocks #1 and 2. they do not appear to be the same rocks between pictures by their shape. I don’t think you have the exact same location photographed here at all. I know an earthquake could break up the rocks, but don’t see how #2 could change in this manner. If the steps change over the course of time how much could they have changed on the north east ridge since 1924? Could render so many different M&I theories for or against a summit meaningless? Guess we need a few more hundred years of observation.